The entire 21 months dark period of Indian democracy was burried under carpet. 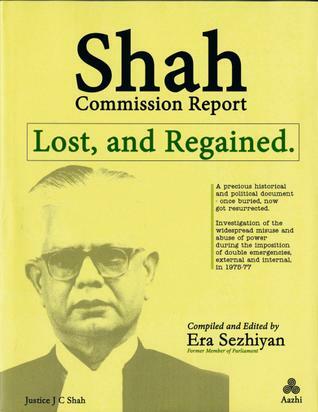 Mr Era Sezhiyan, a well known Parliamentarian and a Member of Parliament during the Emergency period had one copy of the Shah Commission Report in his library. He is now at 91. Now the report has been reprinted and published. I have taken an interview with Mr Sezhiyan about the Shah Commission Report. Please listen to an exclusive interview with Mr Era. 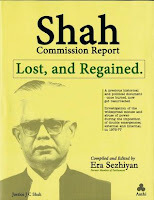 Sezhiyan on Shah Commission Report. The martyrs have been forgotten in the history. Attempts were made to erase this part of the history. Because of the ignorance of this great struggle, even Anna Hazare team calls their movement as 'second freedom movement'. Calling Anna Hazare movement as second freedom struggle will amount to belittling the sacrifices made by Lok Nayak Jayaprakash Narayan and other great leaders. More than 1,40,000 leaders spent their time in prison during emergency days. Let us salute those UnSung Heros who fought to restore the democracy back to India. 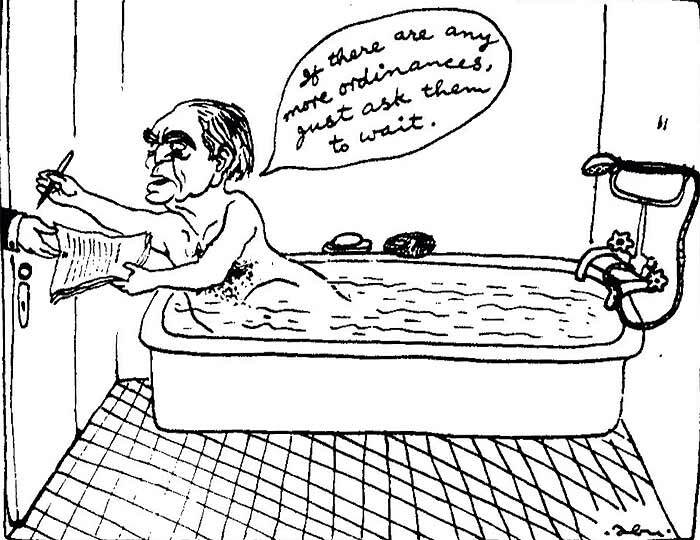 Abu Abraham’s (A well known Indian Cartoonist) cartoon in Indian Express showing Fakhruddin Ali Ahmed signing the Emergency declaration from his bathtub. In this cartoon, President Fakruddin Ali Ahamed tells PM’s emissary, “If there are any more ordinances, just ask them to wait”. This cartoon is the most popular cartoon published by Indian Express with courage during the emergency days. 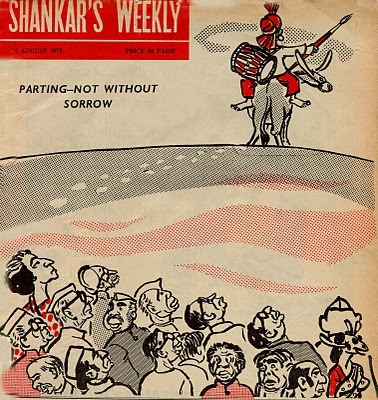 Shankar’s weekly, the most popular cartoon magazine of India, started in 1948, exclusively for cartoons was forced to shut down in 1975 after introduction Press Censorship during Emergency. After 27 years of publication, Shankar’s Weekly published their last edition on 31st August 1975. The cover page carried the words, "Parting – Not without sorrow”.